Contemporary fine jewelry artist Cindy Chao, globally recognized for her intricate designs of rare, colorful gemstones, has collaborated with actress, entrepreneur and philanthropist Sarah Jessica Parker on a singular jewelry creation.The 2014 Black Label Masterpiece “Ballerina Butterfly” brooch (Est. HK$6 – 7 million / US$750,000 – 950,000), co-designed by Chao and Parker, will be auctioned at Sotheby's Hong Kong Magnificent Jewels and Jadeite Sale on 7 October.Net proceeds from it's sale will benefit the New York City Ballet. The Black Label “Ballerina Butterfly” brooch was completed with heart and soul over the course of two years, during which Parker and Chao held several design meetings, reviewed sketches, wax models and gemstones together.Chao began the creation process by building a wax model of the piece, as she does with all of her Black Label Masterpiece creations.The “Ballerina Butterfly” brooch melds together Chao's craftsmanship as one of the jewelry world's premier artists along with Parker’s discerning eye for style and design. The resulting creation is the 2014 Black Label Masterpiece “Ballerina Butterfly” brooch, constructed of a titanium and 18-karat gold body, featuring a cushion-cut fancy brown diamond weighing 26.27 carats, three rough brown diamond slices weighing 47.71 carats in total, three pieces of conch pearls weighing 7.25 carats in total, surrounded by 4,698 diamonds and fancy-colored diamonds weighing 98.09 carats in total, completing the majesty of the Black Label Masterpiece Butterfly.The “Ballerina Butterfly” brooch is inspired by the graceful beauty and elegance of ballet, displaying the sensibility, delicate structure, strength and mellifluous movement exhibited within a ballerina.The brooch can be worn either right-side up or upside-down to create two silhouettes of exceptional splendor. 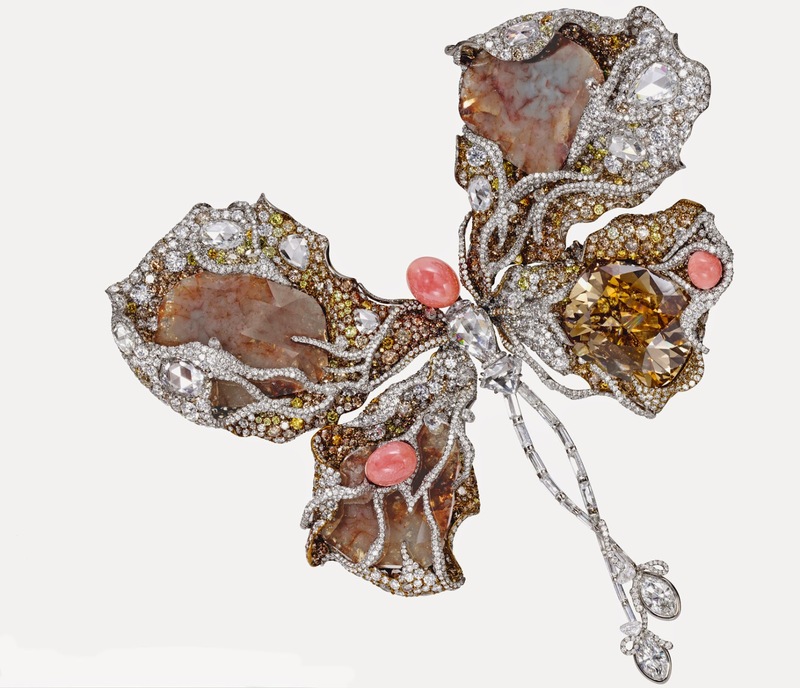 The “Ballerina Butterfly” brooch made its debut during Haute Couture week in Paris, July 7-10.It will travel throughout Asia before going to New York, where Chao and Parker will serve as Co-Chairs of the New York City Ballet's Fall Gala on September 23, 2014.The brooch will then return to Hong Kong in October, prior to the auction.